Round 1: NBEC campaign will reach out to aspiring entrepreneurs, start-ups, and established companies across India. A ‘Call for Applications’ will be announced through various media. Applicants will have to apply online in the prescribed format. A panel of experts from industry academia and investor community will review the proposals and shortlist the top 100 – 150 business ideas. Round 2: The shortlisted applicants will be invited to make a presentation to a Jury. These presentations will be held in 4 or 5 cities across the country. The jury will select the top 20 – 40 business ideas in this round. Round 3: The selected applicants will attend a residential entrepreneurship development boot camp and intense mentoring sessions over 2 days at C-CAMP, Bengaluru. At the end of the boot camp, the finalists will make their business plan presentation before a Grand Jury, which will select the winners of NBEC. Register and apply online at this page. Fill up required profile details. 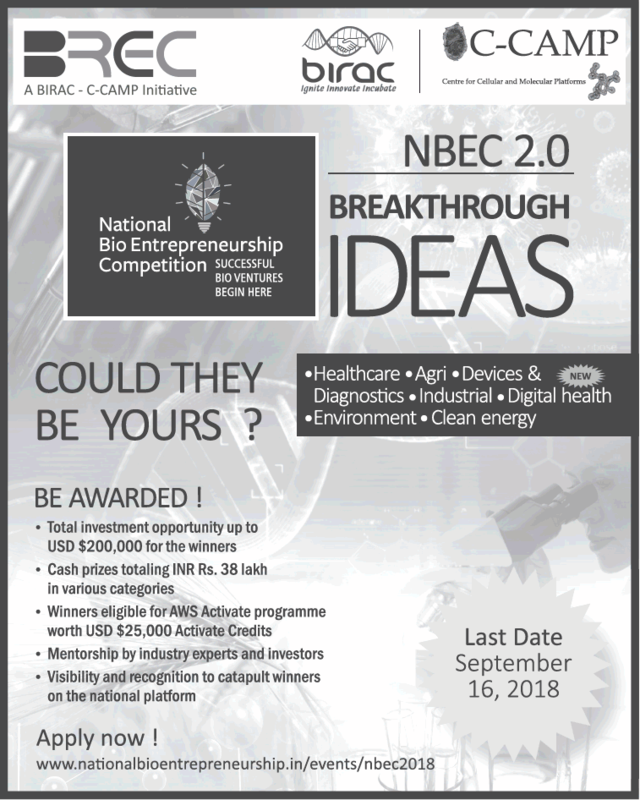 Fill up NBEC 2018 form. The link for this form will be available on the top Menu tab AFTER you sign in. For any queries, write to brec_events@ccamp.res.in.